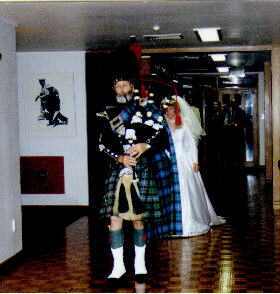 Looking for Wedding, Scottish or Irish, or bagpipe, related information? Scroll on down. We have promotional and information pages, plus links to other interesting sites, and we host homepages, such as for the Clan MacLachlan Society of NZ. For Kilts, Wedding Pipers, Tartans, Piping and associated services Kyle Mitchell. We are Kilt-makers, and are developing a range of accessories we make here in NZ. 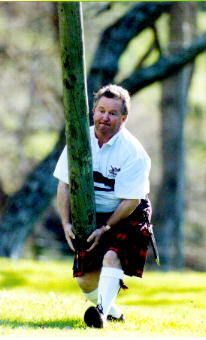 You can wear a kilt anywhere! or for NZ residents making short visits overseas for specific functions. Hire arrangements for international customers to USE IN New Zealand are welcomed. Kilts, Jackets, Belts, Sporrans, Kilt Hose, Garters and Flashes, Ghillie Brogues, Dirks, Sgian Dubhs, Clan Crest Badges, Kilt Pins, hats, caps, scarves, etc. Our kilt quality is as good as you get from Scotland. Kilt styles. If you still want one from Scotland, we can import it tailor-made for you. We can measure you for a kilt or any of the favoured jacket styles - Prince Charlie, Craill, Argyll, or Montrose. The jackets we supply are tailor-made in either Scotland or New Zealand. The best way to choose the tartan you want is by viewing the actual cloth. For this we have books of tartan swatches from the leading Scottish woollen mills, and can import tartan, tweed and barathea fabric for any need. View our kilt hire tartan range. For hand-craft leather day and dress sporrans. These can be all leather or include Celtic cantles and hardware, belled tassels, hand-tooled Celtic designs in leather. 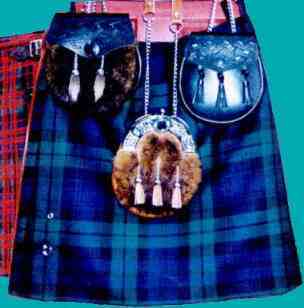 Waist belt buckles (of imported and local manufacture) and Buckles and straps for all kilts. 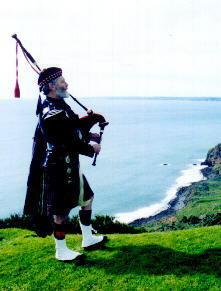 Hire a Piper for a Wedding or any occasion - formal or informal. We can wear 5 different styles of attire and a selection of tartans. 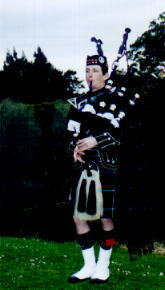 Bagpipes and Piping accessories, practise chanters, tutor books, reeds and bagpipe maintenance supplies. We are agents for ROSS Synthetic moisture control Pipe bags. Woven with 100% NZ virgin wool, on a hand loom in Northland by Mrs Anne McLean. Have your own clan of family tartan woven for that very special gift. If we don't have it and it's an item we do not make/manufacture ourselves here in New Zealand, you can use internet shopping for Scottish gifts from the Clanshop in Scotland. No matter where you are around the world visit the . We support and promote various events and update or add pages as information comes to hand. at the 1999 Gaidhealtachd Feis.